Here at the Lancaster dentistry office of Scott A. Creisher, DDS, we offer general, family, and cosmetic dental care. All of our friendly and helpful staff members – from the dentists and hygienists to the technicians and front office personnel – are passionate about dentistry. We want you to have the best dental care available, at an affordable price. 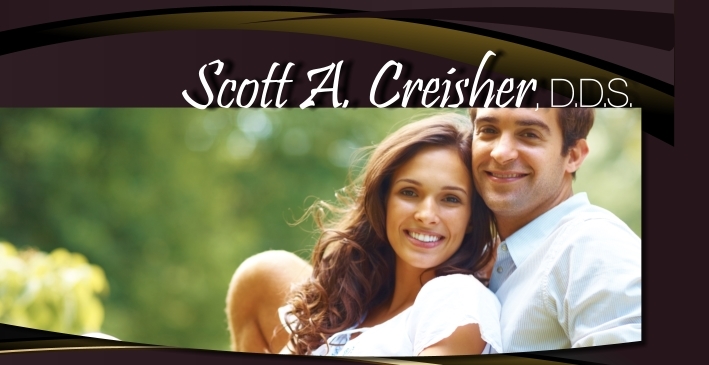 Dr. Scott Creisher is experienced, talented dentist who take the time to listen to and interact with his patients. He believe in the importance of educating the public about home dental care processes and want his patients to understand that healthy teeth and smiles begin in the home,with proper nutrition, regular – and correct – brushing and flossing, and regular check-ups and cleanings. Our dental hygienists and dental assistants are all the best in the field. They pursue on-going dental education courses and strive to provide all of their patients – like you – with comfortable, effective, positive dental care experiences. Further, our Lancaster dentistry front and back office staff members are well-trained and believe in putting the patient’s needs first. That means scheduling appointments that work with your availability, exploring payment options that work within your budget, and always making you feel welcome, relaxed, and pleased to be at our offices. When you are searching for dental care in Lancaster, please call our office. We will work with you to improve your smile, develop proper oral hygiene care, and take care of all of your general and cosmetic dentistry needs. At the office of Scott A. Creisher, DDS, we are looking forward to helping you have the smile you’ve dreamed about. Call us for an appointment, today. You can reach our Lancaster dentistry offices at (717) 394-2641 during normal business hours. Together, we can help you obtain the perfect smile! New patients can save time during their first appointment by completing the Patient Registration form prior to their visit. Simply print out the Patient Registration form, fill in the information requested, and bring the completed form with you to your appointment. Click here to view forms. We accept cash, check, Visa, Master Card, Discover and American Express. We also accept CareCredit which offer our patients special financing options (subject to credit approval). Pay online: Pay online @ http://www.Patientpaycenter.com to register. Enter office location statement code SLQBUD and make your payment.